We purchased these to replace some old, outdated lighting and could not be more pleased. These went a LONG way to help modernize the look of our 1976 home. The finish has held up well and they put out great light! 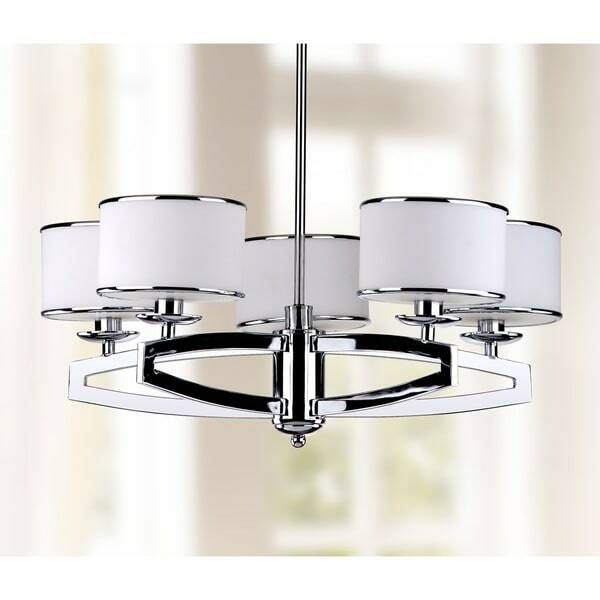 Refined and sophisticated, the Lenora drum pendant will light up transitional rooms in grand fashion. A strong graphic silhouette of gleaming chrome is contrasted with etched white glass drum shades for dramatic contrast and flattering light in any space. 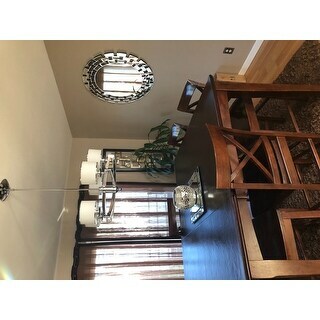 I really love this fixture, it gave my dining room a modern look. I would have rated it a 5 star but 4 is appropriate considering the torture and headache I went through in installing it. Also, the two short piece on either ends got stuck, I was not able to unscrew it. I liked that you can decide on the height. If you want a modern look and have a good taste, this is the perfect lamp especially for the price. I am very impressed. My advice is that you get a professional to install it or be ready for the headache. The instruction is TERRIBLE. If you insist on installing it yourself, read the instructions and also align it with the picture. It took my son and I 2 days to figure it out. It's just perfect!!! I love the bright chrome finish and the frosted shades. It goes perfect with my Mid Century Modern decor. Anyone can do the same old dull gold Sputnick chandelier. I chose sleek and clean with a tiny hint of bling. It will also pick up the metallic silver from my 1957 China. It's pretty and sturdy. It also comes with several stem pieces to hang at different heights. No ugly chains here! I TOTALLY recommend this for its beauty and quality! I have a large bathroom and wanted something pretty to hang. I love this light fixture. I only wish it took regular light bulbs, not chandelier bulbs. But I can live with that. A beautiful light fixture...all that I thought it would be. 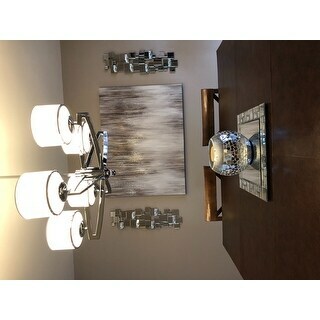 I bought this for our dining room and it really looks great, my husband did not have any issues putting up the light. This piece was perfect in our master bathroom. Simple yet elegant, well-made and very stylish. The light fixture could be used in any room to some character. Beautiful light for our dining room. It really makes a statement with the chrome. Everyone comments how beautiful it is. Would definitely buy again. 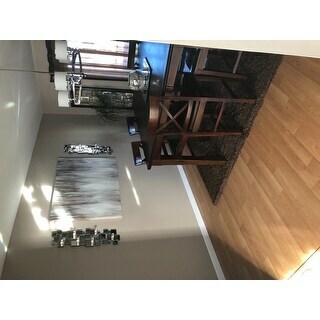 Looks ok but very disappointed with the color on the lamp is supposed to be white but some of them dnt look white they look beige 2 of them look white and 3 beige. I try taking a picture but it doesn't show the difference. Looking to spruce up my master bedroom and this is perfect in the center of the room. My taste is a cross between modern and traditional and complemented my headboard. I'm in love w this! It's so gorgeous and better in person. This pendent light is the perfect addition for my home remodel. I will be using it in my dining room and it will be the perfect touch for the room. Great for EIK, but probably too small for dining room. "Is the lamp very bright?" This depends on the bulb used. I have vaulted ceilings and I searched for long time a lamp that I could use for the entrance that is long enough. It also mb matches perfectly with the others lamps that I bought for the remodel of my home. I also couldn't find a better price anywhere. "Is the height on this fixture adjustible. My ceiling is 10 feet high and I wouldn't want the fixture t come down to 44"." As stated in the name of the product, it is an adjustable pendant lamp. The maximum length is 44” and the minimum is 8”. "Can I use LED lights with this?" "What is the shortest possible length in inches from the ceiling to the bottom of the light fixture?" Not certain but it looks like this light could be mounted so that it hangs down just 14 inches. IF I can trust the little diagram thing in the photos. Please provide confirmation. "After making adjustments, what is the MINIMUM height that can be achieved from the ceiling to the bottom of this pendant lamp?" TUBE PARTS: 12”H x 2pcs + 6”H x 2pcs, TOTAL TUBE HEIGHT: 36”. "Is the length of the bar fixed, or can the fixture be shortened to be closer to the ceiling?" I believe the length can be changed by 12 feet increments. Do you mean 12 inch increments? The past two questions seem pretty straight-forward. The answers? Not so much. What is the shortest length from ceiling to bottom of fixture this light can be adjusted to?